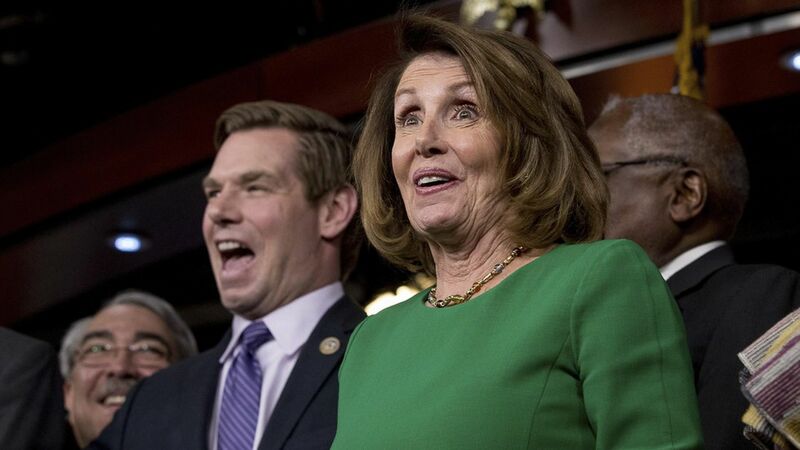 When Nancy Pelosi walked into her office dining room yesterday, CNBC's John Harwood called out, "Look, it's the big loser from the healthcare debate." Harwood was mocking President Trump's unconvincing claim that Democratic leaders Pelosi and Chuck Schumer were the real losers of last week's Republican healthcare fiasco. Pelosi laughed at Harwood's joke. She said she'd read a newspaper headline that called Trump the "closer" but the 'c' was obscured by the fold. Over a lunch of chicken and avocado sandwiches, with about a dozen reporters, her mood ranged from happy to jubilant. Bottom line: Pelosi is in a good place. She's got more leverage than she did a week ago and knows how she'll use it. House Republican leaders face a government funding crisis at the end of April and they may need Pelosi's help to pass the bill. And Trump, after failing with his Republican-only health care strategy, now wants Democrats to help him reform the tax code. She's willing to use her leverage to extract major concessions from Republicans who may need her to support their CR — the bill that funds the government — or, later in the year, the debt ceiling. One way she'll use that leverage: she won't let Republicans do anything to damage the Affordable Care Act, such as cutting the payments to insurers in Obamacare marketplaces. She wants Trump to move quickly on a "big jobs bill" that includes some corporate and middle income tax cuts coupled with government spending to stimulate growth. But she's demanding the infrastructure spending happens on her terms. She told Trump she won't support a "tax bill disguised as an infrastructure bill." Translation: she won't back a Republican bill that spurs infrastructure development by offering tax breaks to investors. She wants the government to spend real money building everything from roads and bridges to broadband networks. She thinks lowering prescription drug prices is an immediate area where Democrats can find common ground with President Trump.